We are very susceptible to subliminal messages. I know this for sure, because when Captain Jonathan kept talking about the shave ice he was going to have as soon as we got back to shore, he wasn't necessarily talking to us, but he might as well have been. The five of us could think of nothing else as our raft pulled up to the dock, so we peppered Jonathan with questions. What exactly is a shave ice? Why is it not shaved ice? Is it the same as the snow cones we have back home? Where is the best place to get a shave ice? Jonathan patiently answered our questions as best he could. 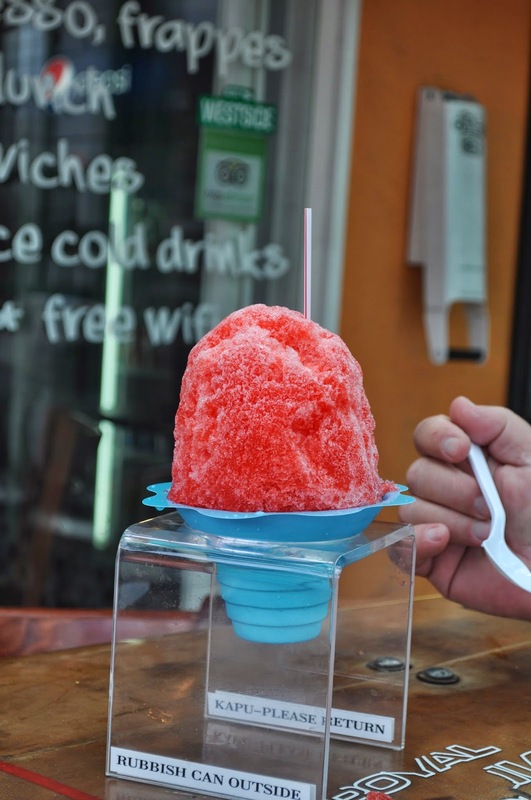 Shave ice is made by literally shaving a block of ice. 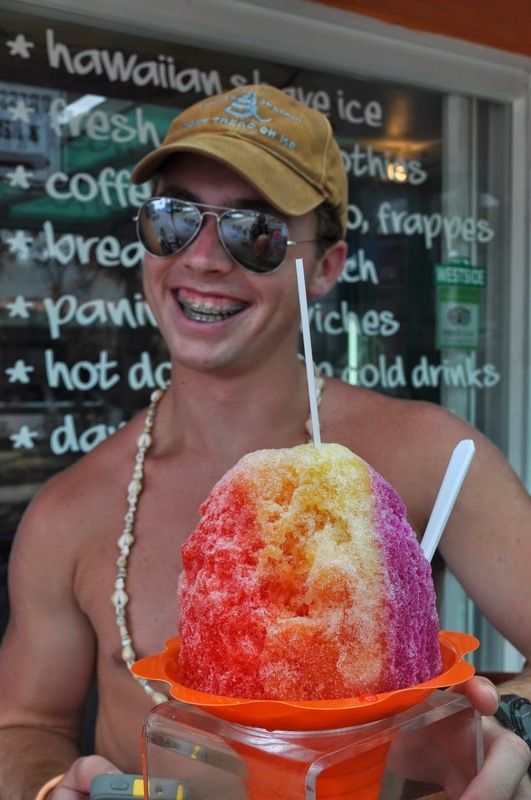 Hawaiians say shave ice, not shaved ice. Our snow cones are not very similar to true Hawaiian shave ice. 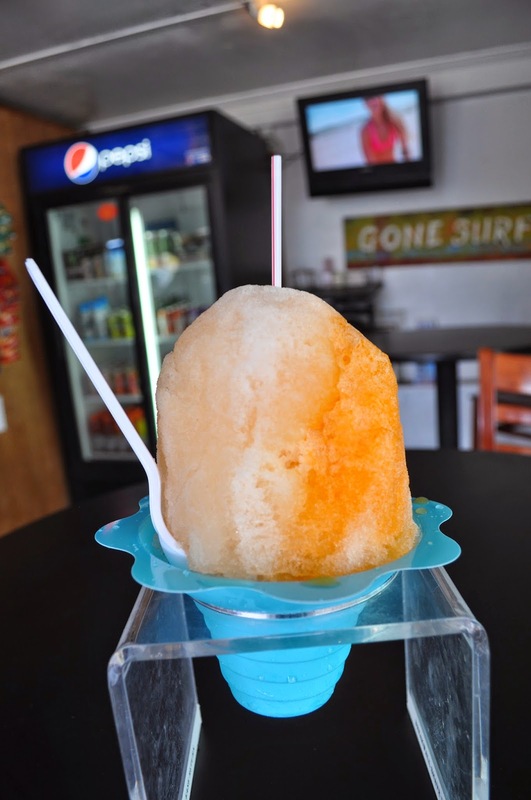 The ice in shave ice is very finely shaved compared to our snow cones. It is light and fluffy...almost like snow. Hawaiian shave ice often involves a layer of tropical ice cream at the bottom or center of the cone and a snowcap on top. I have never had a snow cone at home that incorporated either of these. Jonathan suggested we head for a place called Breakwall to further our research. So, we did! Breakwall is located on the ominously named Prison Street in downtown Lahaina across the street and around the corner from the King Kamehameha III Elementary School. We walked in the tiny shop and found one guy working behind a bar and a line of folks waiting their turn to be served. We stood in line and studied the menu. There was much more than just shave ice on the chalkboard menu behind the bar. It included grilled sandwiches, acai bowls, granola bowls, hot dogs, quesadillas, and fish tacos. But we were there for the shave ice, so we stuck to that portion of the menu. 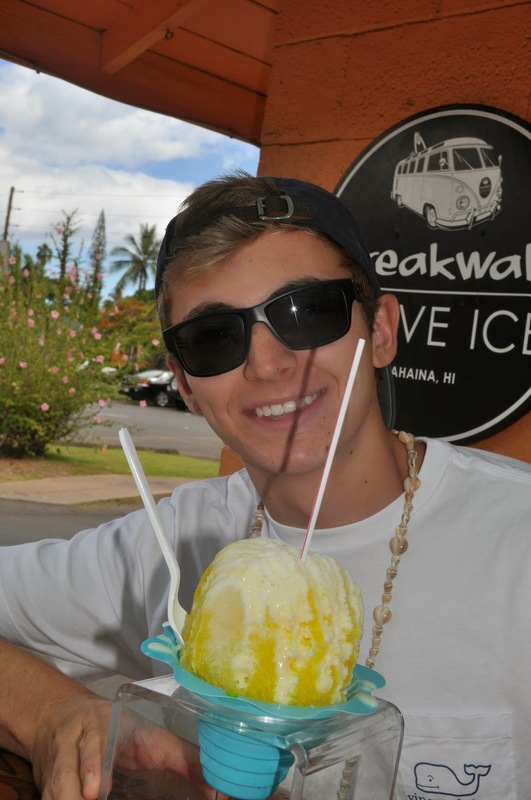 Shave ice comes in three sizes at Breakwall: grom, wahine and da braddah. Grom is a tiny, child size, wahine would be called medium back home and da braddah would be known as large to those of us boring enough to use such dull terms. It turns out, the guy working the bar was named Dave, and he was from Atlanta! 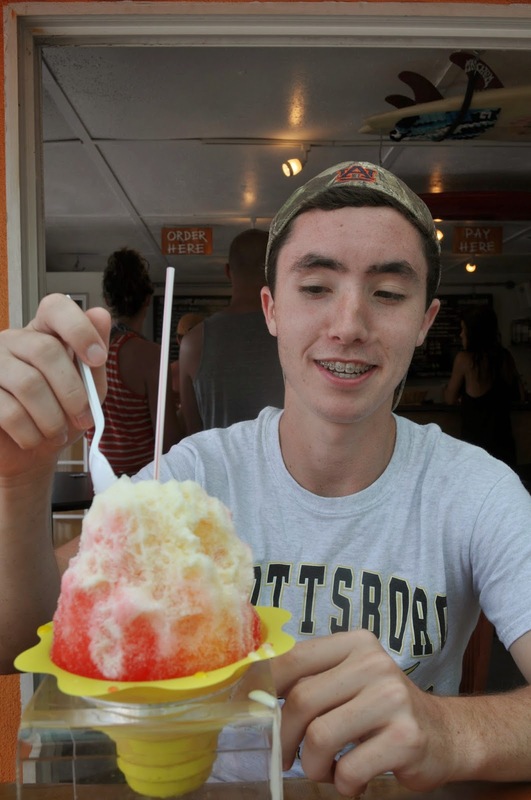 Dave described to us how exacting it is to correctly make shave ice and it all starts with the right kind of ice. You cannot have ice with bubbles or it won't shave properly. Once we picked our sizes, wahine for everyone but da braddah, JD, Dave told us to choose up to three flavors. I ended up with orange mango, pineapple and coconut. I also chose coconut ice cream. Scott chose tiger's blood which incorporated coconut, strawberry and watermelon and coconut ice cream. I can't remember what the boys got except that Rob also got a snowcap on his shave ice. After I tasted his snowcap, I vowed to top mine off with one the next time. I mentioned to Dave that it reminded me of sweetened condensed milk and he said that was exactly what it was. I love sweetened condensed milk! Rob's has a snow cap! To say we loved our shave ice would be a gross understatement. It was absolutely nothing like the snow cones back home. And when I dug down into that layer of coconut ice cream...oh, my! We left Breakwall assuring Dave we would be back. We had to get ready for a luau. When got in our car and headed down Front Street back toward our hotel, we saw Captain Jonathan speeding toward Breakwall on his moped. 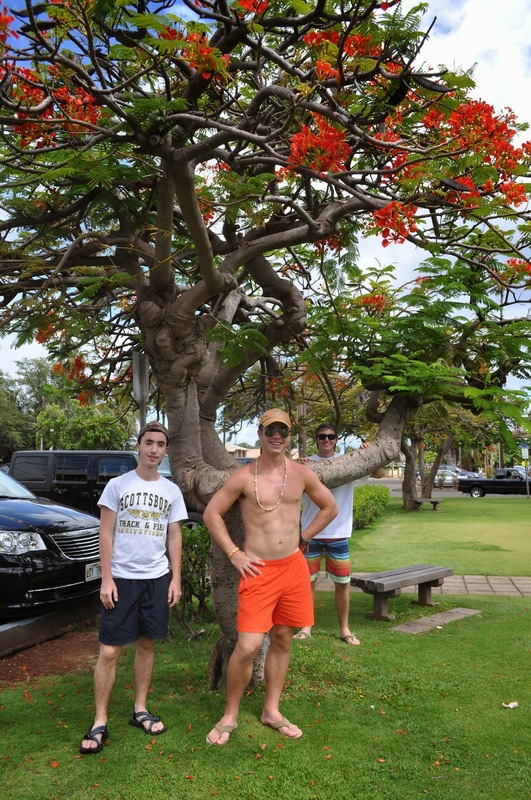 We all gave him a Hawaiian hang loose to thank him for such a great tip! Three Friends and a Fork gives Breakwall 3 Chilly Yums UP!